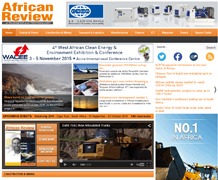 African Review is Africa's premier English-language business magazine. It contains more business-related editorial, more advertising pages and has a higher circulation than any other publication of its kind. Each issue's highly respected editorial contains special sections on a wide variety of topics including information technology, oil and gas and construction. Editorial covers all aspects relevant to Africa's key decision makers.